I did something this morning that almost never happens. I got lost riding my bike. One of my goals this summer is to ride my bike down to the Providence Zen Center (which is actually in Cumberland). It is about a 40 mile ride and the tricky part is wending my way through Brookline, Chestnut Hill and Roslindale until I hit Rt. 1A in Dedham. So, this morning, I headed out, trusty Mapquest directions in my back pocket, to explore the first 10 miles of this ride. The thing about Mapquest is that they aren’t always that up to date on the roads. I found that one road I was supposed to take had been closed to cars. Fortunately, I was on a bike and just rode on through. The getting lost part was all me, though I tried to blame Mapquest at the time. I took a wrong turn (note to self: the directions work much better if you actually take them out and read them) and ended up in Newton Center. I was literally heading North when I thought I was heading South. You understand that this almost never happens. My sense of direction is usually quite good. Well, I poked around in Newton until I’d used up my 10 miles and then started following my nose back the way I’d come. It is a good thing I didn’t try to cut across anywhere since I had no idea where I was in the first place. I might still be out there somewhere! 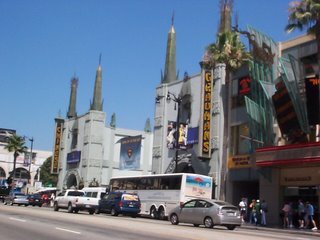 On my last day of vacation we went to Hollywood and did the real tourist thing. Jeff drove us all over and pointed out many, many sights. 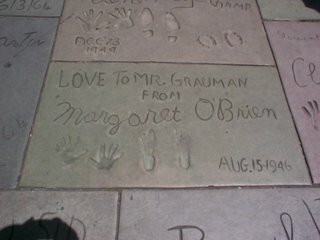 at Gruman’s Chinese Theater. It was very interesting looking at all the hand and footprints. I couldn’t decide whose to take a picture of (the memory card was getting a little full) so I finally settled on Margaret O’Brien (a child start from the 40’s) because she is a favorite of my mother’s and because her little hands and feet just looked so cute. 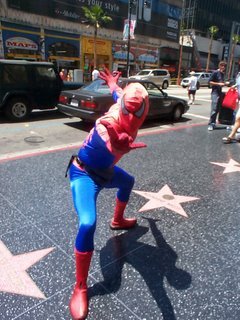 There were a number of Superheros wandering Hollywood Blvd and Spiderman (Little Nephew’s favorite) was kind enough to pose for a picture. Want to see a four-year-old boy’s head explode? Tell him you met Spiderman and have the pictures to prove it! Next stop was the Ripley’s Believe It or Not Museum. 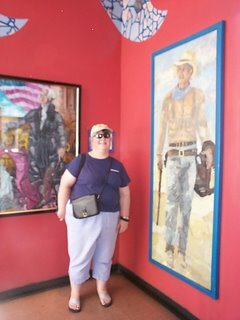 Here I am standing with a picture of John Wayne made completely from dryer lint! 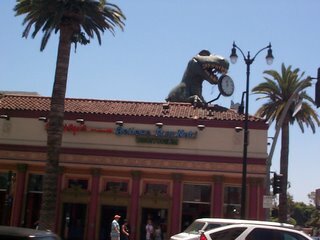 The dinosaur coming out of the roof of the building was very funny especially considering its feet are dangling out of the ceiling in the lobby. Next, we went to a yarn shop. Just a block away from Hollywood Blvd, we found this place! They have a lovely little shop and I even got to talk spinning with the woman working there (she has an old Ashford that needs some repairs). Of course, I had to buy these. Yes, I know I have a shop full of yarn and, yes, I know I hand dye my own sock yarn. What can I say, I have a sickness. To finish up, I’d like to give you a little taste of Sierra Madre Canyon. 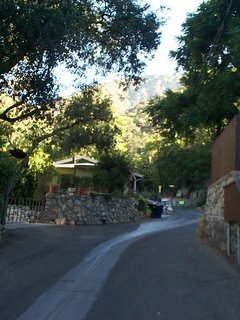 It is a lovely little community tucked up on the mountainside. 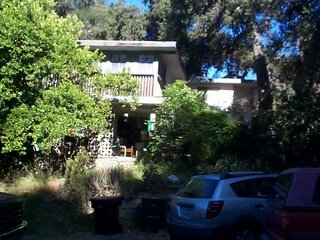 It is like living in the woods. There are live oaks everywhere. 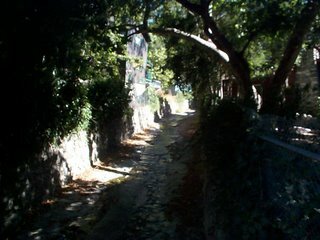 There is a stream that wends its way down through the neighborhood with footbridges across it in various places. It is walled in to be a spillway but that is necessary during the rainy season. Also, notice the drain down the middle of the street. It may not rain all summer but when it does rain in winter, it doesn’t mess around. 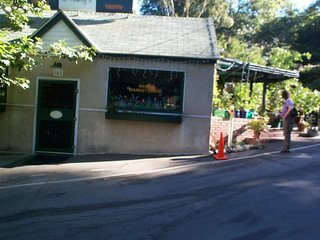 It is a convenience store, diner and all around neighborhood hang out. We had breakfast there several mornings and I really enjoyed the relaxed, ‘chat with your neighbors’ atmosphere. So that’s my vacation. I had a great time and can’t wait to go back! I hope all of you are having a great weekend and not getting lost in Newton. I get to see the new baby again tomorrow and will have some more pictures. Let me know when you guys get sick of the baby pictures. Really, I’ll understand. 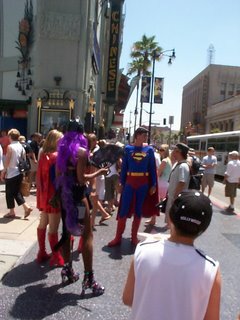 Those superheroes are so skinny! 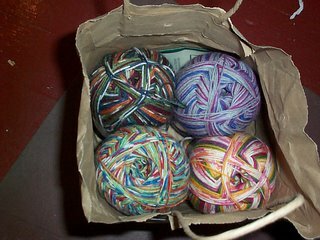 on buying yarn when you own a shop- keep in mind that knitting and yarn collecting are two very different hobbies. yarn shop owning is different still. I think I have the same yarn that's in the bottom right corner of your bag! I could've guided you out of Newton Centre, if I'd known you were there, and if I had been around -- it's not that wild, except for the raccoons, skunks, and occasional opossums, turkeys, and deer. I bet it was uphill all the way from where you wanted to be to Newton Centre, though.